Finding the perfect ring to wear everyday can be a fashion challenge for the horsewoman. So many popular styles just won’t work if you live life with horses – high settings catch easily on tack and in the barn, resulting in expensive lost stones. If you’ve ever got out the muck rake to look for a diamond, you know what we’re talking about! That’s why we’ve developed our line of Rider Rings – jewelry that combines a low-profile with high style! They’re perfect for everyday wear. 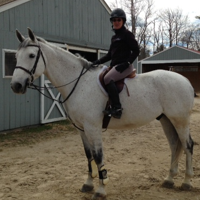 You can look great without worrying that your fine horse jewelry will be damaged. The next silver horse ring we’re going to show you is one of our all time best sellers, and small surprise: it’s easy elegance, combining the shine of sterling silver and the warm glow of 14K gold with equestrian style. 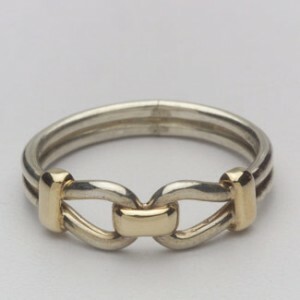 We’re talking, of course, about our 14K Gold and Sterling Silver Bit Band Ring. 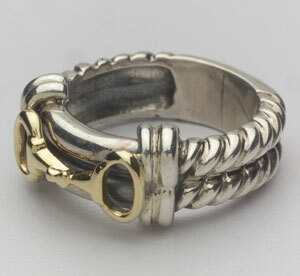 This is one of the stars of our Rider Rings Collection. Great for everyday wear, it’s more than beautiful enough for even the most special occasion. Made in the USA and very reasonably priced – you want this silver horse ring for your horse jewelry collection!